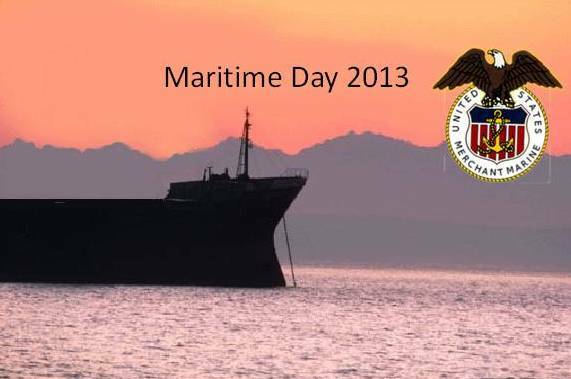 On Memorial Day, honoring the service of merchant mariners – Welcome to the FastLane: The Official Blog of the U.S. Secretary of Transportation. Thank you Tugboat Captain and Enchanted Seashells! My tugboat man is a proud member of the United States Merchant Marine. He is a merchant mariner. He also served in Desert Storm. Most Americans honor those who’ve served in the military, and we can name the branches of the armed services — Army, Air Force, Navy, and the Marines. Here on the Pacific Ocean, we always remember to include the United States Coast Guard. On National Maritime Day, honoring a proud tradition of service – Welcome to the FastLane: The Official Blog of the U.S. Secretary of Transportation. Today T-1 actually has an SOL so there will be no skipping of school. I have to wonder if she realized what day it is when she dressed this morning. She chose to wear a company shirt that commemorates the original fleet of ships the Chief sailed on. This is going to be her toughest SOL today so hopefully she gets a little boost by wearing the shirt her father gave her. T-2 swears she couldn’t find her copy of the shirt… it is a good possibility both have ended up in T-1’s drawers… it’s also a good possibility T-2 wouldn’t see a snake in front of her. They also included a great list of local events if you aren’t in the Washington, DC area. The Presidential proclamation from the White House was a little hard to find (BING! You failed me!). But I found it. You can read it here. My apologies. I think I did the same thing las tyear. Yesterday the President also declared this week Safe Boating Week. Fly your flags proud today! Acta Non Verba! You are currently browsing the snipewife blog archives for May, 2013.